Great... Really pleased with these eye drops, very good value and do the job the well! One of the worst things about contact lens wearing can be dry eyes and the discomfort that they bring. Thankfully, there are some innovative solutions available these days which can rejuvenate weary eyes and restore comfort. The Blink Intensive Tears Bottle is just such a solution, and can moisturize in seconds whenever needed. Copying the biological role of tears, Blink provides a film of moisture across the lens, reducing irritation, redness and that gritty feeling that most contact lens wearers dread. • The Blink Intensive Tears Bottle uses a specially formulated compound called OcuPure which mimics the chemical composition of human tears, dissolving into substances which moisturize the eyes and restoring eye comfort when lens wearing leads to dryness. • Apply the solution in the form of easy to use eye drops. • The Blink Intensive Tears Bottle does not just deal with dryness, but can also help to prevent blurring of vision due to dry, dirty lenses. • Produced by the reliable vision giants AMO, Blink comes in a handy 10ml bottle which will be convenient to transport and store, so that you can moisturize your eyes wherever and whenever needed. 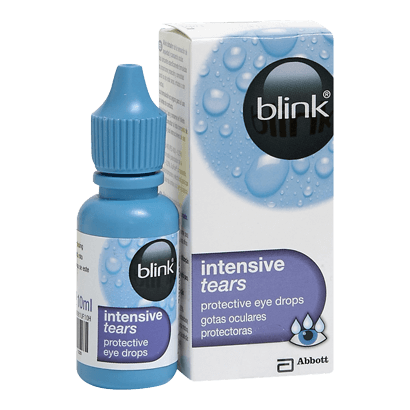 The eye drops contained in the Blink Intensive Tears Bottle brings modern technology to bear upon an age old problem. Cleverly replicating the body's own moisturisation, these are brilliant eye drops for anyone who works in offices or other warm environments.